In this study we compared the pharmacokinetics and pharmacodynamics of captopril after sublingual and peroral administration. Single 25 mg doses of captopril were administered sublingually and perorally on two different occasions in a randomised cross-over fashion to eight healthy volunteers aged 22–35 years. The kinetics of unchanged captopril, plasma renin activity (PRA), BP and heart rate were studied over three hours after both peroral and sublingual administration of captopril. 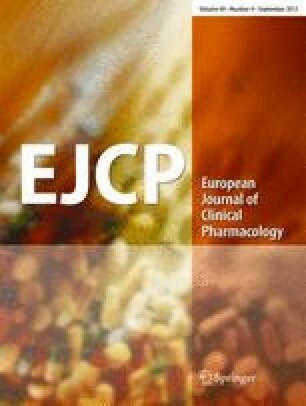 Mean pharmacokinetic parameters for unchanged captopril after sublingual administration were: Cmax, 234 ng·ml−1; tmax, 45 min; AUC (0–3 h), 15.1 μg·ml−1. min. Mean pharmacokinetic parameters for unchanged captopril after peroral administration were: Cmax, 228 ng·ml−1; tmax, 75 min; AUC (0–3 h), 17.0 μg·ml−1. min. tmax was significantly shorter when captopril was administered sublingually; all other pharmacokinetic parameters were equivalent. The plasma captopril concentrations achieved post drug administration led to increases in PRA and reductions in BP. tmax for PRA was 86 min for sublingual captopril and 113 min for perorally administered drug. Peak PRA values were, however, not significantly different. BP, as expected, was not reduced dramatically in these healthy volunteer subjects, however, in systolic BP vs time profiles, BP was significantly lower after volunteers received sublingual captopril. Heart rate increased slightly after captopril administration; there were no differences between the two routes of administration. Administration of captopril sublingually, therefore led to a more rapid attainment of plasma captopril concentrations and had a more rapid onset of pharmacological effect when compared with peroral administration.